being able to play proficiently in all keys all over the fretboard. I am currently writing the book on it. Not quite ready, but as always, you can study the Pattern System with me via private instruction. The book Music Theory for the Bass Player contains the five pentatonic patterns. as does my TrueFire Course. Both of these resources are a great foundation to have for patterns land. The TrueFire DVD gives you a great well rounded view on the basics of the pentatonic shapes – a useful thing for every bass player – and the theory book is making sure you have the theoretical foundation down. The pattern system goes much deeper on fretboard harmony. Your patterns are made for four string, but I have extra strings! What do I do? Adapt? If so, how? Here is my recommendation: yes, you can certainly adapt the patterns and extend them for example by starting them on the lower string, as shown in the black dotted diagram in the graph below. Advantage: pattern stays the same on the bottom and just adds a shape on top. Small disadvantage: the key is now different. Was G, now is D. You have to transpose them all as you first learn them. Bigger disadvantage: The shape is not as accessible, not as pretty, no cool mnemonic, way more info, and while we need that “more info” of course, I have a better way. Okay, you could keep the shape where it is and just extend the pattern to the lower string – how is that? Advantage: that keeps the key the same, but changes the name of the pattern and again has the same bigger disadvantage as listed above. So, what is my recommendation for adapting for five and six stringers, then? Learn them as four-string shapes. Why? Because stuff repeats, over and over and over. I play 4, 5, 6 string basses and if I played 16 string, I would probably still just relate it all to those trusted five patterns that I have under my fingers cold for four strings. You need to know where the root is and have the shape under your fingers – then you won’t have any trouble at all extending the shape to as many higher or lower strings as you wish. So, if five-string bass: learn the shape as a four string shape on E A D G strings, and follow the system verbatim. You will be able to easily extend to the low B, once you have the shapes under your belt. If six string bass: same thing: learn the shape as a four string shape on E A D G strings, and follow the system verbatim. You will be able to easily extend to the low B and high C, once you have the shapes under your belt. For two decades I have been enjoying light bulbs go off when this suddenly connects for learners. It simplifies the neck tremendously. What’s worth mentioning is that the Pattern System approaches the neck a bit differently than most methods I am aware of. Step one is to learn the 5 shapes mechanically – ie, so well that you know it cold, have it under your fingers without needing to hear it. A pattern goes from lowest possible note in one position to highest possible note in that same position, so you are starting and ending with all sorts of notes, not necessarily the roots. Always know where the major root is. That is just a reference. Later you will extend to minor and all modes, but you will be surprised how easy it is at that point. When I say five shapes – there are five major scale shapes and then lots of shapes within shapes – triads, chords, pentatonics. If you have the main shapes down, all this becomes easy. And: it repeats and repeats and repeats, once you see it. I originally learned it from my teacher Wolf Wein and a little later again at the Bass School Munich. I didn’t even realize how lucky I was to have such a great foundation until I saw others without that back ground struggle their way to understanding the fret board. Me and Wolf have further developed the system over the years; I added the goofy names (AKA mnemonics), as well as the diatonic cycle and “shapes within shapes” concept, and Wolf brought the crucial and super powerful mental practice aspect in and many creative uses as well as the overlay with learning to read music at the same time. By the way, Chuck Sher in his great book, “The Improvisor’s Bass Method” lists the five shapes in the major key with some great ideas for improvisation. 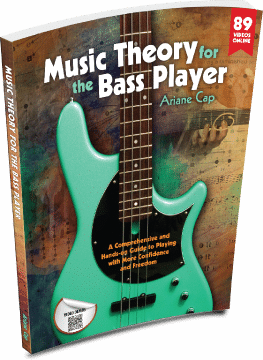 The Pattern System for the Bass Player will be a Book and a Course. ETA is still a bit up in the air, so stay tuned. In the meantime, if you have not worked your way through Music Theory for the Bass Player yet, do it now, because it will be nice to have it under your belt for “The Pattern System for the Bass Player”, when that’s ready. Also, the 20 Unit Course is a recommended foundation to get your theory down and used in grooves! If you have my pentatonic course or are studying with me, the below new graph will come in very handy to help you understand why I recommend learning the shapes as four string shapes. But even if you don’t know what the Pattern System is and how it works, you will get a lot out of studying this graph about how the bass is laid out. If you are curious about the five pentatonic shapes, their goofy names, how to get them down mechanically and improve your technique in the process, how to correctly use pentatonic for major and minor contexts, how to use them to solo over a blues and more – on one word, how to high five it up, my pentatonic playground course is for you. Music Theory for the Bass Player also lists the five shapes (major and minor contexts) in the pentatonic chapter. And, yes, the Pattern System (first book, then course) is in the pipeline. And I am incredibly excited about it! And that’s why Ariane’s Bass Course is the best ~ impeccably practical. Thanks Ari!